The eye-popping highlights and detailed shadows of HDR video no longer demand thousands of dollars, thanks to Vizio’s latest M-Series TVs*. The 2016 Vizio M-Series starts at $850 for a 50-inch TV. Other models include a 55-inch set for $1000, a 60-inch set for $1250, a 65-inch set for $1500, a 70-inch set for $2000, and an 80-inch set for $4000. All sizes support HDR, short for high-dynamic range, which allows for a brighter display with greater range between light and dark images. Vizio is partnering with Dolby Vision, whose HDR enhancements are available on Vudu and a handful of Netflix videos. Much like Vizio’s high-end P-Series, the new mid-range M-Series no longer includes a traditional smart TV interface. Instead, the TVs have Google Cast built in, allowing supported apps and websites to launch video on the big screen. (Just look for the Cast button in supported apps like Netflix and Hulu.) 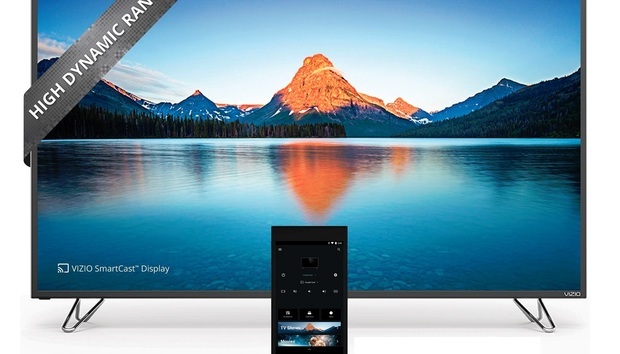 Vizio is throwing in a 6-inch Android tablet to serve as a dedicated smart TV remote, along with a basic IR remote for volume and input controls. The primary differences between M- and P-Series sets are the design—the P-Series sports anodized aluminum instead of plastic—and the number of active LED zones, which allow for more precise deep black levels in darker parts of a scene. The M-Series has 64 zones (or 32 zones on the 50-inch set), compared to 128 zones for the P-Series. If you’re into the idea of a Google Cast TV, but don’t want to pay extra for HDR, Vizio is also bringing the so-called “SmartCast” tech to its 2016 E-Series sets. You can check Vizio’s website for the full rundown, but some highlights include a 43-inch 1080p set for $370, a 55-inch 1080p set for $570, and a 65-inch 4K set for $1100. These TVs do not include a tablet remote, like the M-Series and P-Series do. Why this matters: Until now, HDR has been an expensive add-on for high-end TV sets. Samsung, for instance, charges $2800 for its cheapest 65-inch HDR TV from this year’s batch, as does LG for its 65-inch LED TVs with HDR. Both of those are nearly double the price of Vizio’s set at the same screen size. More lower-cost HDR sets should be coming soon, from lesser-known brands like TCL and HiSense, but for now Vizio has the prices to beat. *Vizio itself now uses the term “Home Theater Display” instead of “television,” because it’s no longer including coaxial input for over-the-air antennas in any of its Google Cast-enabled Ultra HD sets. Vizio may not be allowed to use the term TV, but that’s what we’re still calling them in lieu of any evidence that Home Theater Display is a phrase used by actual humans.